From left are council members Scott Cowan, Jason Yutzie, Mayor Clayton Wood, Darrin Lane and Lisa Metz-Dittmer. 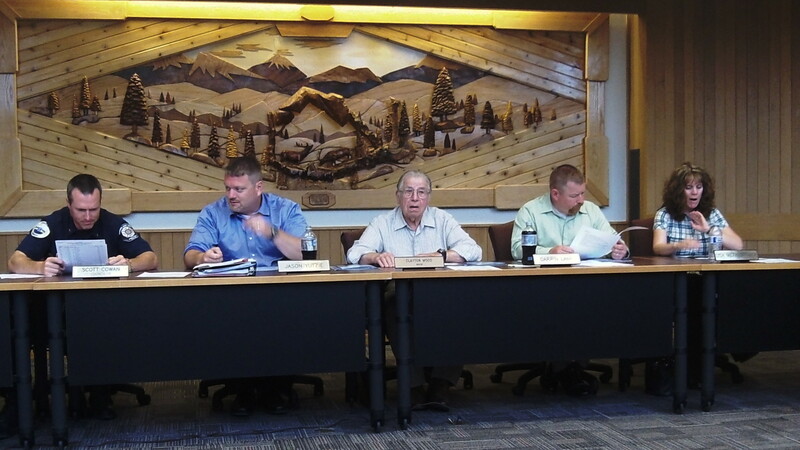 Public skepticism notwithstanding, the Millersburg City Council seems determined to keep pressing ahead with the idea of replacing Pacific Power & Light and forming a municipal utility to sell electricity within the city limits. On Tuesday night the members consented to a plan presented by Councilman Darrin Lane to form a six-member committee charged with working out what Lane called an “implementation plan” for how the city electric utility would be set up and how it would be run. He and another council member, to be named by Lane will represent the council. Two business people (one from ATI Wah Chang) and two Millersburg residents (one of them an opponent of the plan) are to round out the panel, the way Lane explained it. He envisions that the committee’s plan may call for Millersburg to build its own substation to serve the city and its industries rather than taking over Pacific’s Murder Creek substation. He thinks this will substantially reduce the cost of the takeover. 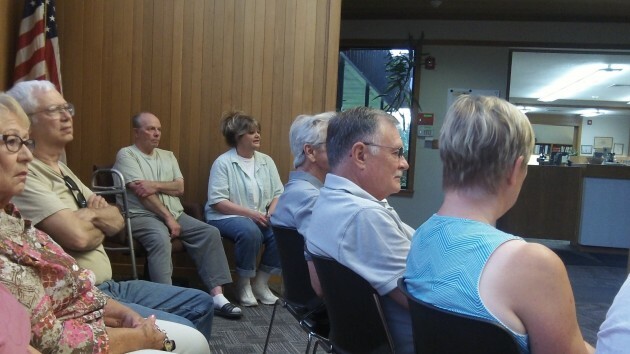 Part of the Millersburg council’s audience Monday night. As Lane explained it, the committee will hire the EES consulting firm from Washington state to advise it, but only if Wah Chang covers that cost. He thinks the committee, once formed, can presents its plan to the council and public in three to four months. EEA already reviewed and reinforced a feasibility that contended Millersburg would save a lot of money by forming its own utility. The way In understood Lane, the panel and its plan would nail down all of the important details of a municipal utility so that the council the public could get beyond the competing statements they’ve heard so far from consultants and Pacific Power. There was virtually no council discussion and no vote on the formation of this committee after Mayor Clayton Wood announced that the council would go this route, suggesting that the idea was worked out ahead of the meeting in an executive session with the public excluded. Pacific Power has said its system within the town of 1,500 is not for sale, and its president, Pat Reiten, has said the utility would fight a Millersburg takeover to the end. At two well attended hearings on the proposal in May and June, most of the members of the Millersburg public who spoke were skeptical of the idea or against it. Many also demanded an election on the issue, but so far the council has not committed itself to call one.